You are now being targeted! Chromia is a natural born soldier, her calm and unique battle style allows her to discourage her enemies via sabotage that allow her team member to gain an upper hand in the heat of battle. Although she is usually cool and distant, but her attitude softens after being partnered with Ironhide. She is now more supportive toward her fellow Autobots. Chromia, as I mention before, I know nothing about Chromia pre-IDW. Sooo, let’s talk about the mini comic that this figure, came with. Like Arcee, Chromia also come with a mini comic that have no real story, it’s just a funny comic that you can read featuring the character of the figure. This time it’s centered around Tigatron. One day, Tigatron makes a wish in the temple for a robot friend that is as pretty as Auntie Arcee. I think god misheard his wish because the god’s oracle told him that his wish will be granted and every female robot warrior will arrive shortly. And then a space bridge opened and Bam, Chromia landed just in front of him. You can imagine how surprised he is right now, I would be too if a giant freaking robot just landed in front of me XD. Chromia explains that Tigatron is being targeted, she and her fellow female warrior is here to protect him. And now a confused Tigatron is being surrounded by a group of fembot, among the group are what seems to look like a female Optimus Prime, Prime Arcee, Minerva, Elita One, Energon Arcee (Ariel), Arms Micron Arc, Sari Sumdac and a few of unknown fembots and minicons. The group is warned by Prime Arcee when another space bridge is opened. Out of the new space bridge portal is the bad girls, here to claim their master, Tigatron. The bad girls consist of Strika, Animated Blackarachnia, Cybertron Thunderblast (who also call Chromia in japan, there should be a joke between two Chromia), Airachnid, Shatterglass Sari Sumdac, a cute mermaid who calls herself Nabiko (with a shark ALT mode) and a few unknown fembots that lead by Slipstream. Cat-fight break out and Tigatron is being thrown off in the heat of battle, fear not, here come Chromia, catching Tigartron. Well the battle is getting too dangerous and Chromia decide to bail. In the background Firestar is seen fighting Thunderblast and Nekomimi B is seen killing an unknown fembot, one of the unknown bad girls has a light saber XD. Well, in the end Chromia transformed into her ALT mode and zoom Tigartron to safety. Tigatron woke up, realizing that it was just a dream, he turns to his army of fembot and thank them for saving him. The next day, Cheetor pass by Tigatron at the temple and he asked him, has his wish came true and Tigatron just nod and he has gone to make another wish at the temple. Now, that is a fun and easy comic to read. Now to the review. This is just a repaint of the Hasbro release of Chromia, so there aren’t any changes to the basic bike design. However the new paint job is enough to separate it from the Hasbro version. Chromia’s ALT mode is mainly blue with white highlight, some light purple here and there, some orange and red. She got two types of blue, one are the light blue of unpainted plastic and the other are a metallic light blue that almost similar to blue chrome. I really like this metallic blue, I wish the whole figure painted in this blue, she would look really awesome. This Chromia look differs from the Hasbro version even though they basically have the same design. The differ came from mainly the painted windshield, that change its design, it’s a small change, but enough to give it a new look. Like Hasbro’s Chromia, the front of the bike still doesn’t peg in properly, however, unlike the Hasbro version, the joint of wings on the front of the bike on this Chromia is tight enough that it seems to peg in properly. Good job Takara, for hiding this design flaw. Takara does a good job on the bike mode, the paint job is nicely done, the only design flaw is hidden well that it doesn’t seem like a flaw, I might even say that they fix the flaw. If I have any complaints is that the ALT mode is not accurate to G1 Chromia which this figure is represented. 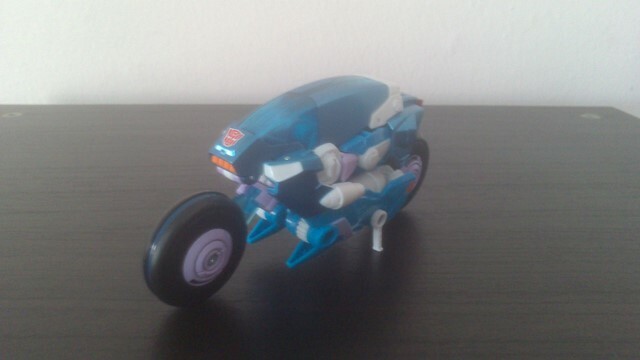 If I remember correctly, G1 Chromia’s ALT mode is a light armored cybertronian car like Moonracer and Elita One. 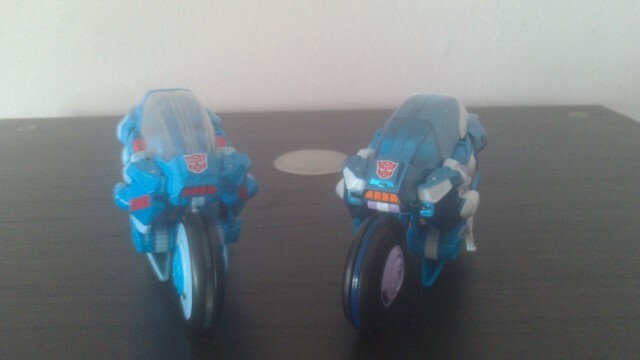 Because of the painted windshield, the bike mode isn’t accurate to IDW either. But that is just me nitpicking, overall, the ALT mode is pretty good. 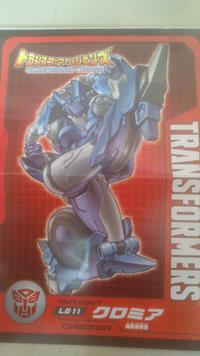 Transforming to Robot mode is very similar to PRiD Arcee, so it's pretty simple and easy to learn. Like the Hasbro version, it has 2 extra step which is, 1. You have to unpeg the windshield to unlock the front of the bike and 2. Flip up the tail of the bike to unlock the arms. 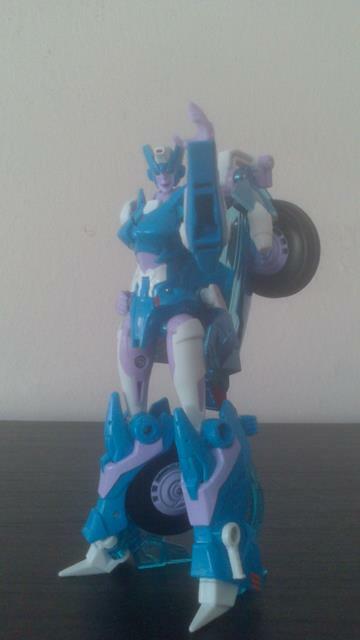 In robot mode, she is mainly light blue with white and light purple as a secondary color and a few red. Because there is more light purple in the robot mode, she seems different color than her ALT mode which consist of mainly blue. Her head is accurate to G1 Chromia and nicely painted complete with lipstick and the red on the forehead. Additional to that, she got a great light piping because unlike the Hasbro version, this Chromia got clear blue instead of smoke for eyes. The light purple while some may not like it, I personally enjoy it because it helps the white to break up all the blue making her a much more interesting figure than the Hasbro version. The light purple works extremely well on her face to make her eyes pop. She also got a small Autobot insignia on her chest. However, the light purple as nice as it is, not quite accurate to G1 Chromia cause in G1, it’s light blue not light purple, another reason some may not like it. Her legs can swing forward 90 degrees, depend on how much you flip up the back skirt, it can swing backward for as much as 90 degrees, almost a full rotation at the thigh, knee bends almost a 90 degrees and nothing at the foot. For weapon, she only comes with one hand gun that can be held by hand or pegged into her legs in both robot and bike mode. Overall, she looks really nice and well articulated, but she still suffer all the same problems that the Hasbro version has, the disproportionate arm, the articulation limiting back skirt, the bulky backpack is still present, not so surprisingly since this is just a repaint. Durability: 8, nothing falls apart, all the joints are just tight enough. Aesthetics: 7, pretty accurate to G1 in robot mode, not quite in ALT mode, but it’s still pay homage to G1. Value/Price: 3.5, Transformer Legends line is still new, but it’s an import figure, so the price is slightly higher the normal. Overall: 8, Chromia is a pretty good figure overall, nice looking bike mode, nice looking robot mode, a lot of the problem present here, also present in the Hasbro version. If you like G1 Chromia, I would recommend this to you even if it’s not 100% accurate because, like Arcee, this is probably closest you’ll get to a show accurate G1 Chromia. 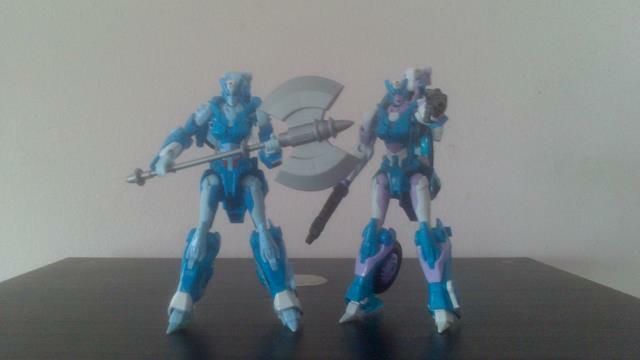 If you dislike the light purple, you can always get Hasbro version, but that version is closer to IDW Chromia than G1.